Being a South Indian myself, I am wont to think that I don’t need to dine out in a restaurant that specializes in South Indian cuisine. Why, my mom could churn out the same things at home and I would probably like that better because my palate has developed a taste for it over the years. This deluded thought process however, has robbed me of one of the best fine dining experiences the city has to offer – till today. (Ok, it was three weeks ago, but let’s not get that specific!). Dakshin has been rated time and again as one of the finest South Indian restaurants in the country (It just won the Times Food Award for the third time in a row this Sunday). Specializing in authentic coastal and regional specialties of the five Southern states (Telangana included) – it strives to recreate the splendor and diversity of a cuisine that is definitely not restricted to Idly-Vada-Sambhar. The restaurant has taken it up a notch and now indulges us with an array of forgotten dishes that it has painstakingly recreated. 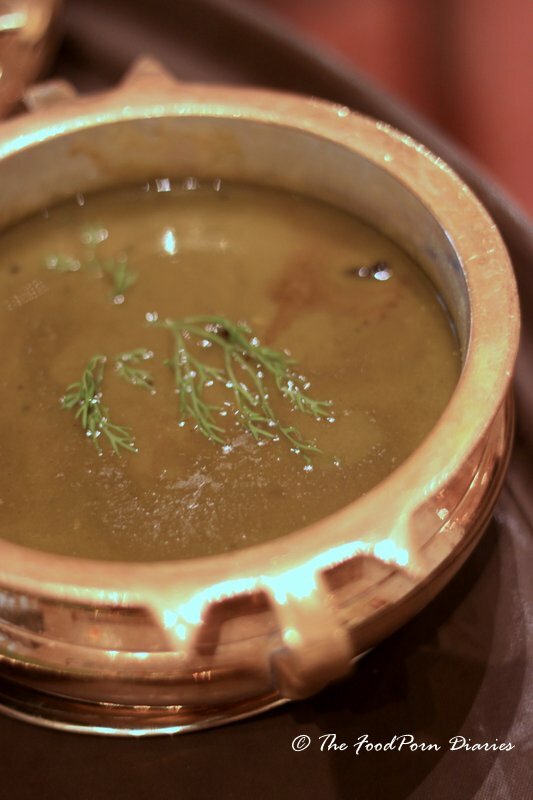 Presenting … the new Dakshin menu. The setting is regal and definitely encompasses an old world charm that you can’t shake away easily. Think teak wood doors, brass handles, and gorgeous bronze statues and copper lamps. The ambience somehow goads you into minding your manners and sitting up straighter in your chair. One that indulges you with silverware, even as it coaxes your to eat with your hand. The stylized temple door menu lists within its pages sections like ‘Sarvottam’ – signature classics, ‘Prarambham’ – starters, Region wise specialties (Karnataka, Andhra Pradesh, Telangana, Tamil Nadu and Kerala), ‘Annam’ – accompaniments and ‘Madhuram’ – something to hit your sweet spot. If you need help navigating the menu – don’t hesitate to ask the waistaff for recommendations (including spice levels 😉 ). The traditionally dressed waistaff are polite and charming and ITC being ITC, will ensure the service is impeccable. 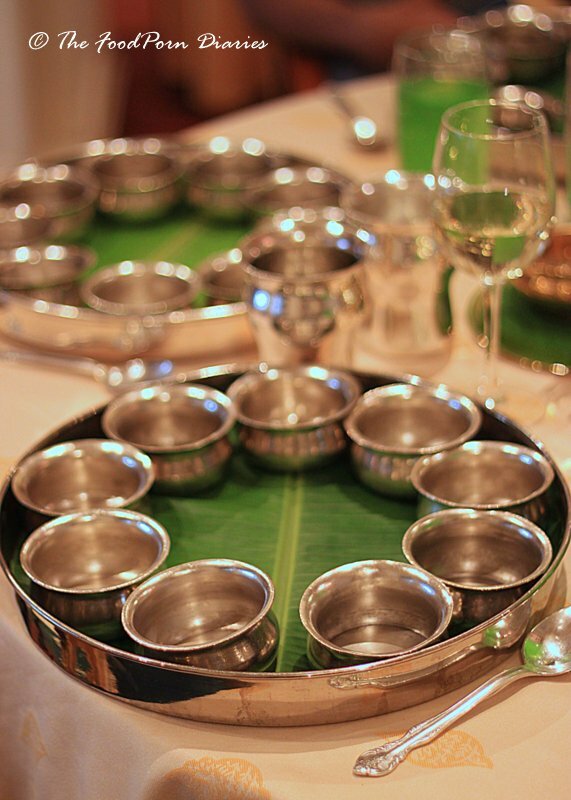 The amuse bouche in Dakshin comes in the form of a variety of papads that support the star – the Iyer’s trolley. Palm sized Adai’s (lentil and rice pancakes) in different flavours and grains are masterfully paired with coconut, mint, red chilli and dal chutney’s. The Mokkajona Vada (deep fried sweet corn and rice dumplings) was a new addition to the trolley and made for a nice nibble before the feast that followed. 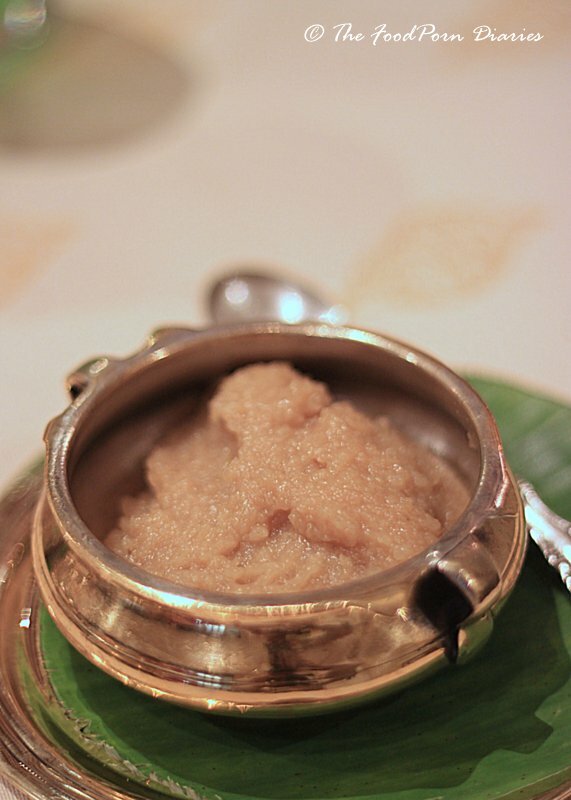 A couple of sips of the Muneer (tender coconut, khus and jaggery concoction) to whet our appetite and we were ready. Out of the three chicken starters I tried, the one that literally blew my mind was the Mirupakayi Kodi (Chilli Chicken). 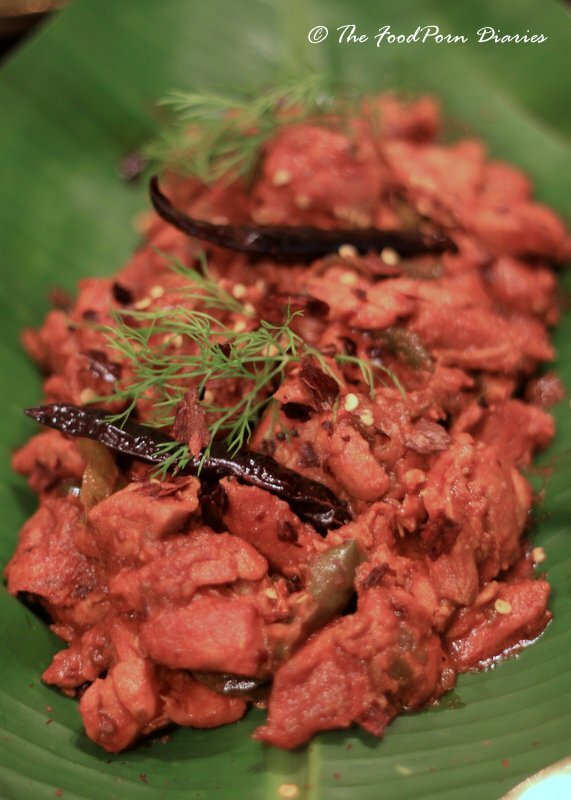 The so-called Andhra Chilli Chicken in restaurants across the city, are a just imposters next to this spring bird. Marinated and slow cooked with the dried Guntur Chilies from Andhra – you can literally feel smoke coming out of your ears. Definitely not for the faint-hearted! (I have Andhra and Karnataka genes, so I don’t count)! A milder version of this, can be found in the Chicken legs cooked in a green chilly masala. If there was any debate on which chilly is hotter – this day resolved it for me! The Kozhi Roast (Slow roast spring chicken with chef’s special masala) is a less spicy alternative and quite the crowd pleaser. 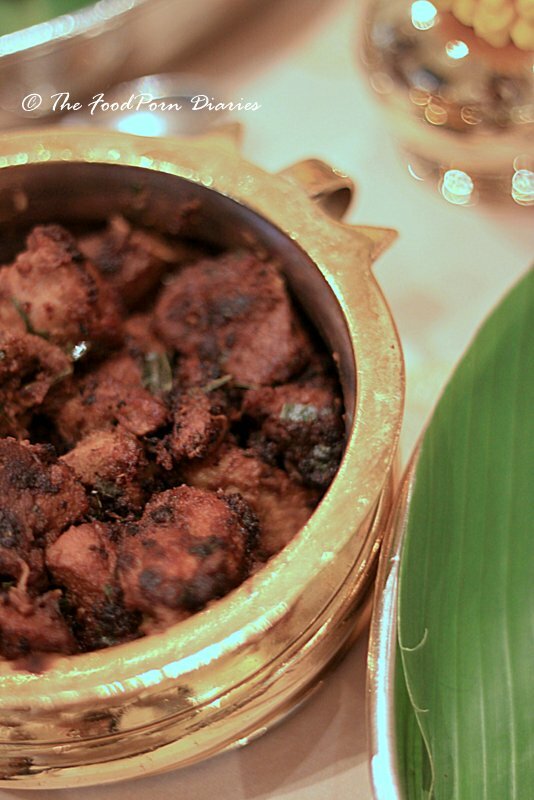 The Mutton Sukka, a dry preparation of lamb morsels cooked with black pepper, cumin and fresh coriander leaves is a favorite in tiny bars across the south. Thankfully you can eat it on a silver plate in Dakshin, instead of a beaten up steel one on NH4. The mains comprised of curries both vegetarian and non-vegetarian served with Appams or the more interesting Ragi (finger millet) Dosa. 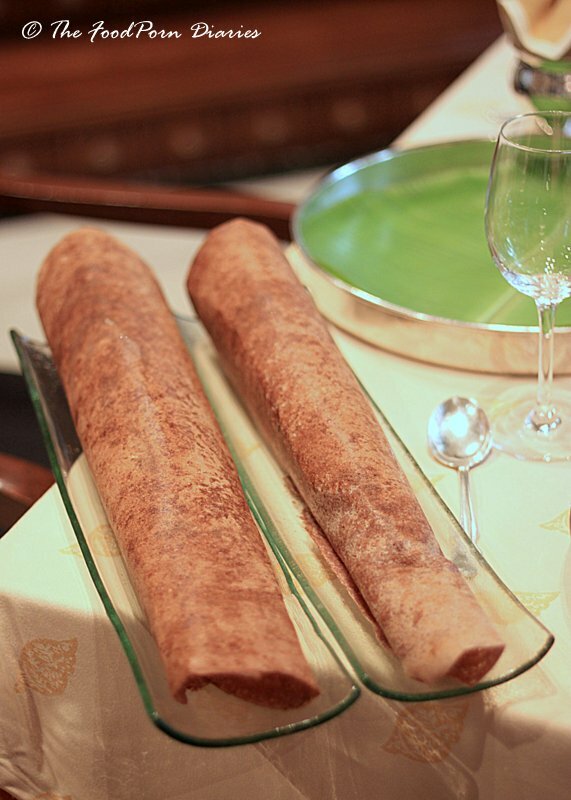 The foot long dosa is made paper style and there’s some nostalgia in eating the same for me. (Old Bangaloreans will recall Dasprakash on Infantry Road). The Baine Barthad (sweet and sour preparation of aubergines and onions) is one of the must try’s from the Karnataka section. The Massopu Saru (garlic flavoured curry with mixed greens and lentils) reminded me of the Soppu Saru that my mom makes at home. And this one was just divine. Ask for some hot ghee and pour it over the Saru to unlock some more delicious flavours and aromas. We tried the Kootu Saru (Curry of mixed vegetables cooked in a coconut, lentil gravy tempered with garlic) and a Kalasu Koora (Mix vegetables curry of green capsicum, string beans, black eyed beans and shallots) and the vegetarians will appreciate the how beautifully the different flavours all tie in. The Kozhi Kurma (tender chicken simmered in poppy seeds with coconut paste) and the Araicha Attu Curry (traditional lamb curry flavoured with a blend of hand pounded spices) were faultless. 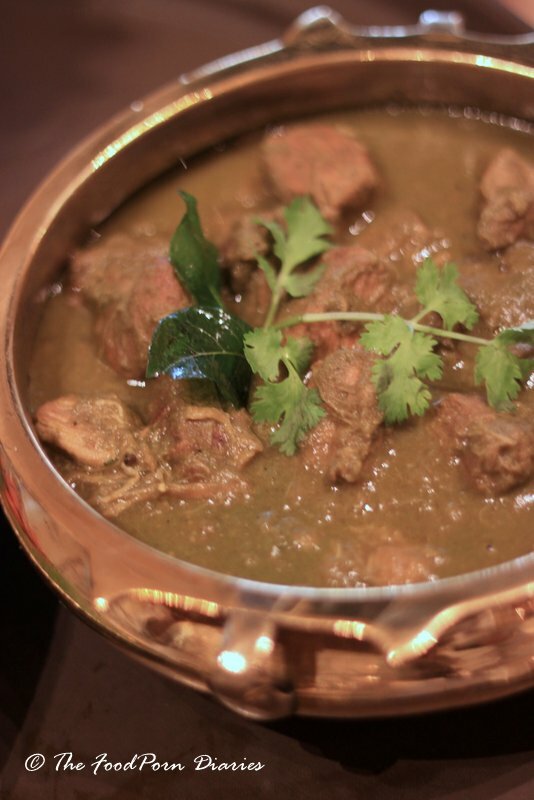 The lamb was fall off the bone tender and the silky curry was perfect to mop up with the appams. For dessert we tried the extremely rich Aadikkumayam. A halwa made out of ground moong dal, urad dal and rice. What makes it so decadent is the measure for measure of ghee (clarified butter) that the mixture is slowly cooked in to achieve that rich taste. It might not look like much, but one spoonful and you know this was something only the uber wealthy could afford in days of yore! 25 Golf Course Road, Bangalore 560052. Parking: Valet || Cost: Rs.3500/++ for a meal for two.